ESPN.com is running a poll that allows fans to rank the 16 Playoff teams. I'm a huge fan of polls, especially when they involve the Blazers. I find it incredibly interesting and entertaining to see what fans across the country feel about our local northwest franchise. After last night's beatdown on the Thuggets, I had to put the Blazers in the 5th spot, but as you can see from the rest of the country, they think the Nuggets are the much better team. 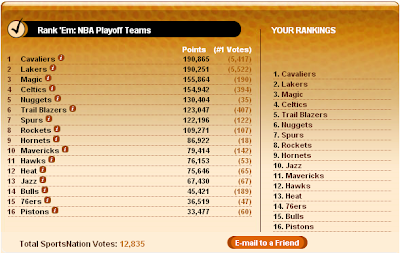 And how about that Eastern Conference...Go vote!